The Tech Graphics, Visualization and Usability (GVU) Center hosted an exhibit celebrating twenty-five years of research. This exhibit, “Nostalgic Futures: 25 Years of Reimagining the Future,” was on display in the third floor Winsett Gallery of the Clough Undergraduate Learning Commons from November 2018 through January 2019. The exhibit contained video interviews with members of the GVU Center, such as James D. Foley, Stephen Flemings Chair in the School of Interactive Computing, Keith Edwards, the GVU Center Director, and Elizabeth Mynatt, the executive director of the Institute for People and Technology and former director of the GVU Center at Tech. Since its creation, the GVU Center has taken an interdisciplinary approach to technology, one of the first groups of its kind to do so. “There was this interest of bringing together the world of graphics and the world of how things looked on the screen with the world of interaction. And to do that well, we needed expertise in design and psychology and computing, and GVU was the first effort on campus to bring all of those people to the same table,” Mynatt said during the exhibit. Last Thursday, two Nostalgic Futures curators, Laura Levy and Clint Zeagler, held a discussion about their exhibit in the retroTECH Lab, along with Library Exhibits Manager Kirk Henderson. The retroTECH Lab is located in the Data Visualization Lab on the third floor of the Main Library. 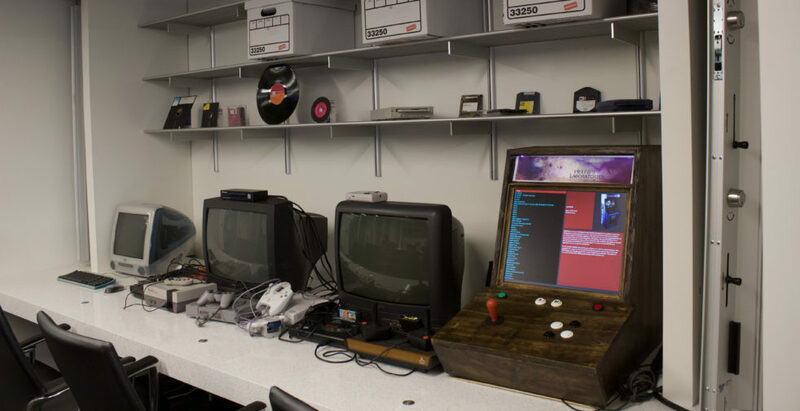 It displays a number of decades-old computer games and technology, each previously owned by a member of the Tech community. The mission of retroTECH is to inspire technological discovery based on past technology. “Today’s program is just a further iteration of our effort to … preserve the aspects of Georgia Tech’s research and its contribution to the digital and educational culture,” Henderson said. This event is also the beginning of a continued collaboration between the Library and the GVU Center. Laura Levy works as a human factors psychologist in Tech Interactive Media Technology Center, and she takes a behavioral approach to understanding technology. “Good technology should just be seamlessly integrated in our lives, it shouldn’t be something we struggle with, but I still use a lot of the same techniques and methods that I was using as a biologist,” Levy said. Clint Zeagler is a research scientist for the Interactive Media Technology Center and an instructor in the School of Industrial Design. Zeagler teaches courses on wearable product design. “In the beginning, [GVU] started with user interface and graphics, [and] the point was how do people interact with the computer in a way that they should, or is easiest for them, and for me, to do that, you have to reach out beyond just having great computer scientists, you have to have people with human factors, and psychology, so it’s this umbrella of people … that work together in groups. And it still does that. That’s how I got involved,” Zeagler said. One focus of the GVU Center has been working on toolkits for creating video-user interfaces. One GVU Center project that the Nostalgic Futures exhibit highlighted was the Aware Home. It opened up in May 2000 and received lots of industry support and large grants from the NSF. The aim of the project was to create a comfortable home setting for the aging population by using technology to tap into the infrastructure of the house. “We will all experience some disability over our lifespan, whether that is losing our vision, or hearing, or mobility. As we age, these pieces of tech with sensors help us be empowered in our own homes,” Levy said. The exhibit also touches on the future of the GVU Center, and what their research might look like in the next 25 years. “Fundamentally, GVU’s overall mission is still the same, it’s to improve the human experience through technology, but the ways we do that now are much more broad-reaching than they ever were in the past,” Edwards said in the exhibit. For more information about the Nostalgic Futures exhibit and the GVU Center, visit their website gvu.gatech.edu.